An action shot of our mechanical room at night. Two Grundfos Alpha pumps in the mechanical room. 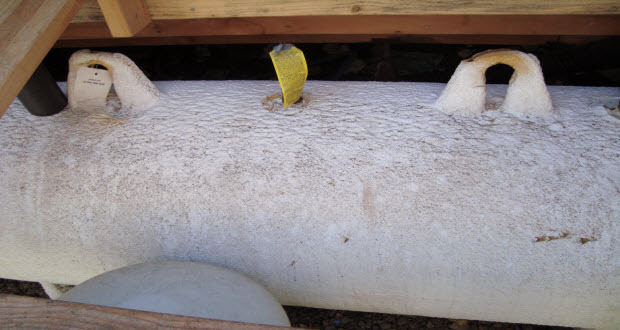 Our insulated buffer tank that is used in the primary conditioning loop. Our shading system down over the west endcap during construction. 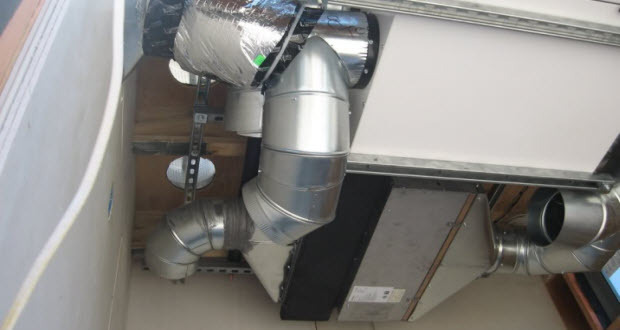 This picture shows the ERV as well as some ducting. We have designed Refract House’s thermal systems to provide complete comfort while using an absolute minimum amount of energy. Radiant heating and cooling combine with a small dedicated outdoor air ventilation system and energy recovery to maximize efficiency, while the digital control system allows the system to respond intelligently to the demands of the house, resident, and even the local utility. The thermal systems are designed to work with the house’s design to enable the large endcap and courtyard vistas, allowing the resident to choose between peak efficiency and luxury. The windows and blinds can be controlled automatically for optimum passive heating and cooling, or the resident can make their own decisions, like opening all their sliding doors during large parties and still keeping their guests cool using the Warmboard radiant panels. Refract House also features instant hot water provided by a highly efficient heat pump water heater. Refract House has been engineered to be ultimately luxurious for the homeowner, with vast south-facing glass entryways, a long tubelike structure, and a very small space for mechanical equipment. This made the task of engineering efficient systems for it a great challenge, since they had to be very flexible to allow for both very small and very large loads, depending on occupant behavior. Refract House is set up to be able to shift major demands – namely heating, cooling, and domestic hot water heating – to accommodate the pricing structure of the local utility. If the local utility does not buy back electricity or have a tiered structure, residents can still get peace of mind knowing that they are helping grid health by using electricity when it makes the most sense (either daytime or nighttime, depending on local electrical resource profile). Residents can also choose to operate this equipment when it is most efficient (storing heat and hot water during the day, or storing coolness at night). Refract House can control the admittance of heat automatically if the user enables automatic blind control. This allows it to drastically reduce both cooling in summer and heating in the winter, although the user can manually override this depending on their daylight preferences. Similarly, the automated clerestory windows can be enabled to ventilate and cool the house with no energy consumption. The thermal system employs a seasonal buffer tank that is kept cool during the summer months and warm during the winter months, allowing instant delivery of heating and cooling. The buffer also allows the system to run the heat pump when it is most efficient during the day, or when electricity rates are low to save money and promote grid health. The heating, cooling, ventilation, hot water, and fenestration systems are controlled by the Uponor Network Control system. We have specifically engineered the system to allow the user complete control of the environment, including temperature, humidity, CO2/VOC levels. It also allows them to impact the energy use of the system by enabling different modes such as “smart grid” or “passive house”, or to set vacation dates and control setpoints, all remotely via a web interface. System information is displayed on the house energy monitoring system. The home's temperature can be programmed from the student-designed iPhone app, the home's touchscreen, as well as from a website. The hot water temperature can be similarly programmed. Without the precise controls, doing Radiant Cooling within the structure would be much more difficult. The heating and cooling of Refract House is accomplished with a super-high efficiency (18 SEER) air-to-water heat pump chiller that uses electricity to move heat from the outside air to water or vice-versa. This water is then pumped to the radiant system and fan coil unit to condition the house. The heat pump can be run at different times to maximize efficiency (making cold water during the cool nighttime) or at times of reduced electrical demand, all at the behest of the resident. Radiant heating is a comfortable, efficient, and healthy technology that is becoming increasingly popular in new construction. Radiant systems save energy because they do not require large fans to move air around, and actually keep residents more comfortable because they radiate directly to residents. The lack of a large blown-air system also reduces dust and contaminants and keeps the house quiet. Refract House employs this same technology to both heat and cool, keeping residents comfortable while using a minimum amount of energy. Radiant cooling is a very new but very promising technology in the HVAC industry. 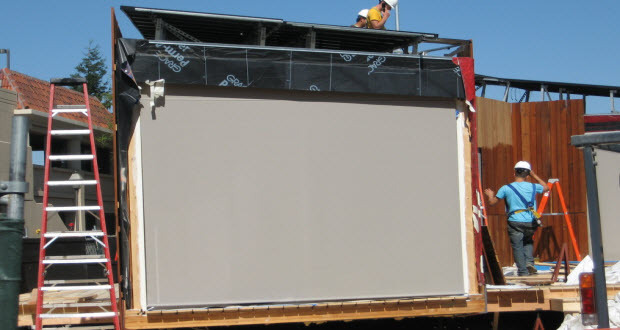 Refract House uses a small blown-air system to complement the radiant system with dehumidification, fresh air, and additional heating and cooling. This system is very small thanks to the radiant, allowing it to bring in only fresh air to the house and not recirculate stale air. It features smart controls that allow it to enable optional energy recovery (pre-heating/cooling and humidifying/dehumidifying incoming air with exhaust air), as well as mechanical ventilation (where cool air is brought in without conditioning to cool the house) when conditions make it favorable. 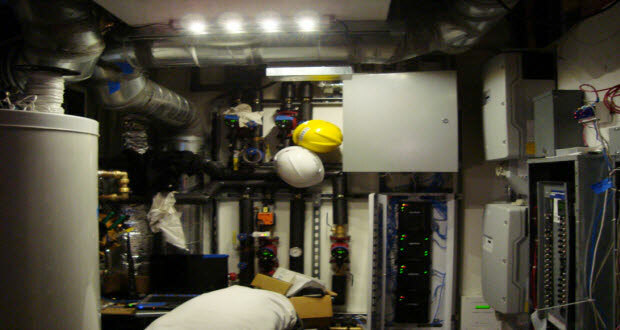 The energy for Refract house’s conditioning is transferred by a water in piping network called a hydronic system. 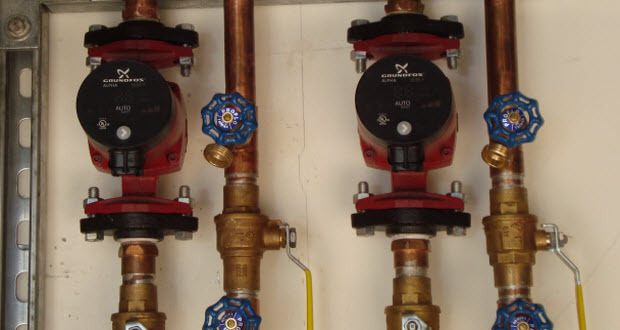 All the equipment, pumps, and controls have been engineered to use as little energy as possible, while delivering exactly the prescribed water temperature quickly to ensure optimum system performance. This control is especially critical in radiant cooling, where temperatures must be maintained above the dew point to avoid condensation inside the house. Smart pumps, precise digital temperature and flow control, minimal piping and valves, and hydraulically isolated primary/secondary loop design make this possible.